Magna Carta (sometimes called "the Magna Carta") is a historical document from 1215 that is important for restricting the power of the king of England. Written and forced into law by rebellious barons, it declared that no one was above the law—not even the king. Before this, medieval English royalty had absolute power. This meant that the king had supreme control over his country and could write or change laws on a whim. Magna Carta's check on monarchy had an enormous influence on Britain, the rest of Europe, and the world as a whole. The barons were actually protesting to gain rights for themselves, rather than advocating for the rights of the everyday peasant. But still, this was a stepping stone toward modern democracy. Meaning "The Great Charter" in Latin, Magna Carta was written under King John of England, who reigned from 1199 until 1216. The King was forced, at least for a time, to support this revolutionary document that treated the King as having limitations under the law. When faced with rebelling elites and their armies in 1215, King John had the option of either losing some rights under Magna Carta or losing his kingdom entirely. Tensions with the Church had increased so much that the Pope had excommunicated the King for the four years from 1209 to 1213. England also lost a decisive battle to France in 1214. As if the loss wasn't bad enough, the English army had been filled by knights in service of the country's barons. The barons were required to provide knights as soldiers to King John; the knights could only refuse to serve by paying a sum of money known as scutage. This was a highly unpopular system, as were the terms under which the barons had to swear loyalty to the King. In medieval England, everyone was viewed as having a place in society, and as long as they did their job, everything would be in harmony. Every position had responsibilities. For example, though the king had tremendous wealth, he was expected to reign well and protect his kingdom. Barons, though they had to swear loyalty to the king and outfit him with soldiers, were promised that the king would ensure their safety. When this system broke down, people became dissatisfied. By 1213, the barons and the leaders of the Church had come to view King John as being both greedy and remiss in his duties. When King John rejected their calls for change in 1215, the opposition also refused to budge. As the carefully balanced hierarchy became upset, a large group of barons mutinied against the King, taking London with their armies. King John was left with little choice but to agree to the barons' Charter of Liberties, later called Magna Carta. Peace was fleeting. King John was infuriated and, within weeks, refused to abide by the agreement. The barons countered that they wouldn't give London back. By September 1215 a civil war raged, with the rebelling barons going so far as to urge France to side with them and conquer England. When King John died in 1216, the future of not only Magna Carta but of England itself was uncertain. 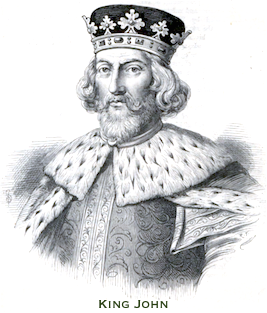 King Henry III was only 9 years old when he succeeded King John. With power diffused, and in order to bring an end to the civil war and to re-establish the barons' loyalty, new versions of Magna Carta were signed into law in 1216 and 1217. In 1225, when Henry became King in his own right, he agreed to a fully rewritten, final Magna Carta in exchange for a massive tax. Of the 63 clauses in Magna Carta, the one with the most far-reaching effect was the 39th, which decreed that no "freeman" could be arbitrarily imprisoned or otherwise punished without a fair trial. Though it was revolutionary, only those Englishmen who held property and significant fortunes were actually considered free at the time, so the clause had little effect when it was written. Subsequent generations have continuously reconstrued it, coming to view it as an historic law favoring personal freedom. The other clauses covered a wide range of topics—merchant rights; standardized measurement of wine, corn, and cloth for trade; a degree of independence for London and other towns; more rights for the English Church; prohibiting a widow from being compelled into another marriage (though she still couldn't choose her own husband). Overall, the clauses checked the monarchy's power while giving additional influence to "the people"; at the time, this meant the elite barons but later, by extension, it would grow to mean the entire population. Magna Carta influenced the world in two major ways. First, its clauses put unprecedented restrictions on the king. In 1215 and 1225, the document had relatively little impact as its clauses only affected the elite, just a tiny fraction of the populace. Yet, in the long term, the Magna Carta set the stage for Britain—as well as the rest of the world—to limit monarchical power. In Britain's case, today the royal family are mainly just figureheads of the nation. In the United States and France, the broad steps towards anti-monarchism that began with Magna Carta led to revolutions. Though these countries had two very different outcomes, monarchy in each gave way to an egalitarian revolution. This is not to say that Magna Carta directly led to these events, but it was one key point in a very long series of shifts of global political power. Indeed, even the common idea of "absolute power corrupts absolutely" (from Lord Acton) has some of its origins in Magna Carta's arguments against arbitrary and unaccountable power. Second, Magna Carta had a tremendous influence on later constitutions, which often incorporated many of its doctrines. Its ideas can be seen in the unwritten British Constitution, the US Constitution and Bill of Rights (1791), the Universal Declaration of Human Rights (1948), and the European Convention of Human Rights (1950). On a final interesting note, King John may have been the inspiration for the villainous King John in the Robin Hood legends.